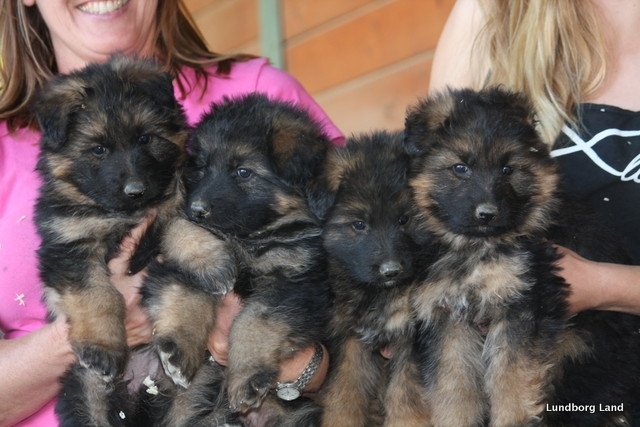 Lundborg-Land German Shepherd Kennels offers German Shepherd Puppies for sale in California. Purchasing a German Shepherd from Lundborg-Land is fun an easy. We carefully guide through the process of buying your new puppy or dog. We take deposits on the litters when the female is confirmed pregnant. You can see what German Shepherd puppy litters we have available by clicking Puppy Litters. The deposit is a non-refundable $500.00 as it takes the German Shepherd puppy off the market. If we can not supply you with the puppy of your choice in the litter of your choice, we will apply your deposit to the next litter of your choice. We accept Visa, MasterCard, checks and cash. The price of the German Shepherd puppies vary depending on the German Shepherd studs we use. Please be sure to read and print out our German Shepherd Puppies and German Shepherd Dog Contract linked here. Click Here. We offer fully trained German Shepherd Dogs for sale, here in California or from Germany. You can see what older German Shepherd Dogs we have for sale by clicking Dogs For Sale. We have an outstanding business reputation and have been recognized as one of the top German Shepherd Breeders and Importers for many years. We can import German Shepherd females in whelp, bred to Excellent (V) or Excellent Select (VA) studs for your consideration. Your new German Shepherd puppy will go home with two shots and wormed several times. The puppy will be sent with the Kennel Medical Records, AKC Certified Litter Certificate and Registration Form. The puppy will have been socialized with family, friends and grandchildren until they are ready to go to their new homes. Be sure to read our German Shepherd Puppies and German Shepherd Dogs Proper Feeding article to start your new German Shepherd off on the proper diet. Call us today at (951) 443-4318 for more German Shepherd puppy and German Shepherd dog information or click here for our contact form and we will promptly reply to your German Shepherd needs.